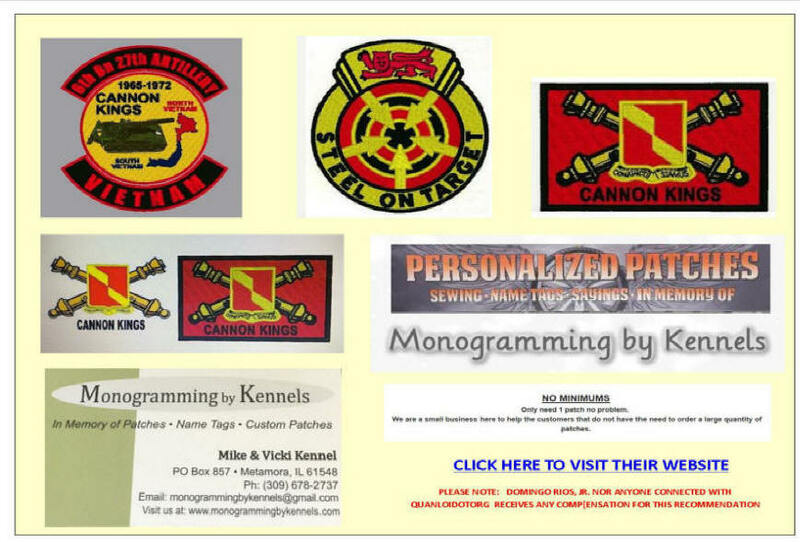 Looking For Special Made Patches, Insignias, Vietnam Baseball Cap etc.? Domingo Rios, Jr., fellow CannonKing, Alpha Battery 6/27th Artillery, Sep 69 to Aug 7, has had several patches made by Mike & Vicki Kennel and has been very satisfied with the results of their work. Domingo served two tours in Vietnam - His first with the 2/94th Artillery on the DMZ and his second with the 6/27th Artillery in Quan Loi as a gun sergeant. He will receive no compensation of any kind for this recommendation and simply wanted you to be aware of their excellent services.